Signs are shipped via Purolator, and large heavy weight sign orders will be shipped via a freight company of our choosing anywhere in Alberta. Delivery & Freight charges may be applied to your invoice upon delivery. Should you require special delivery instructions please e-mail hello@310sign.ca or call 1844-289-7446 and we would be happy to assist you. For pick-up orders, simply specific upon Checkout that your wish to pick-up your order from 9570 58 Ave NW, Edmonton, AB T6E 0B6 and we will ensure you receive notification that your order is ready for pick-up once it has been produced and packaged. Tracking numbers will be supplied where available. It is our #1 goal to get your signs & labels shipped to you as soon as possible. 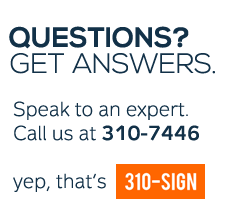 Should you have any questions please do not hesitate to email hello@310sign.ca or call 1844-289-7446. We're here to help. Please note: shipping and tax costs are ESTIMATES. Every effort has been made to be as close to actual as possible, but the charges may be slightly higher or lower when your order is shipped and billed.